This dog seems to think he is a horse. His pose looks like a show horse. This week we are showing photos of the architecture of ancient Khmer temples of Cambodia on our Viva la Voyage travel photo site. What would a beach be without children? Not a beach, in my view. My morning walk along the beach included a glimpse of this girl finding a spot in the sand to set her things, in the midst of a large lava outcropping that is exposed at low tide. The receding waves and tides leave patterns in the sand. I took this photo along the shore of the Langosta Estuary near where it empties into the ocean. I suspect that the estuary accounts for the streaks of color in the sand, as the water from the estuary would carry some sediment. The couple that I showed yesterday I first spotted and photographed a long distance down the beach. They later came and walked past me. I got this photo after they past. I think it is charming that they were holding hands on their long walk on Langosta Beach, even though I assume that the are not newlyweds. This is another photo taken from Langosta beach near the mouth of the Langosta Estuary. Doesn't this look like a lovely day for a long walk on a pristine tropical beach? Tomorrow I will show you a closer view of this lovely couple. This week we are showing photos of the colors of temples of ancient Khmer temples of Cambodia on our Viva la Voyage travel photo site. I like the combination of driftwood and a tree in the foreground, reflections in the middle, and distant clouds to add depth or "layering" to this photo. This is near the mouth of the Langosta estuary, with the ocean just on the other side of the sandy ridge across the estuary. The estuary adds a little variety to my morning walk down Langosta beach, as it has a somewhat different ecosystem than the surf and tide pools along the main part of the beach. Today is Sunday, so we have new photos posted on our Viva la Voyage travel photo site. This week we are showing some photos of the architecture of Cambodia from our trip this past Spring that included several days at Siem Reap to see Angkor Wat and other temples in the area. This is a little hard to see, but there is a crab at the entrance to his burrow in the center of this photo. The little bumps of sand that you see all around this area are the tailings removed by the crab when he dug his burrow. He removed sand from his hole by bringing sand to the surface and depositing the sand around his hole. It is a curious behavior. The crab is shy. When he sees humans near his hole, he stays underground. For that reason, I could not get very close for this photo. This would make one wonder, how deep is his burrow? How much room does a crab need? Maybe his wife makes him keep rearranging the furniture in his burrow. This week we have more photos of Julie's recent raft trip through the bottom of the Grand Canyon on our Viva la Voyage travel photo site. What better place for a run than the beach? There are more people getting exercise surfing than running on Langosta Beach. Both are good exercise, but I think surfing would be a lot more fun. I have never tried surfing, which I know is shameful for someone who lived in Hawaii as a youngster and who has a condo right on a world-class surfing beach. I don't run either. A tennis injury that fractured my ankle years ago and resulting complications make that no longer possible. Perhaps the tracks in the sand in yesterday's photo were made by a tiny crab dragging a shell on his back. There are lots of these little crabs and shells in the tide pool areas of the beach. Humans were not the only ones making tracks on the beach. It looks like a little animal went out for a morning stroll as well and walked by this shell. Tomorrow I will show who I think it might have been. This week we are showing photos of the colors of the bottom of the Grand Canyon on our Viva la Voyage travel photo site. This is a different type of post for me. I usually show beach scenes, tropical flowers, wildlife, etc. On my July morning stroll on Langosta Beach that I have been showing lately, I did notice an airplane flying instead of the pelicans who usually fly by. This is a Sansa airline plane, with landing gear down, getting ready to fly past Tamarindo beach and then land at the small airport in Tamarindo. The best part of these flights is that the wings are above the windows, so everyone has a good view. The first time Julie and I came to Costa Rica, we spent a little more than a week traveling around the central highlands and over to the Caribbean coast, then we took a 45 minute Sansa flight from San Jose to Tamarindo. We fell in love with Tamarindo and bought our first condo there. On all of our later trips, we have flown into the international airport in Liberia, just one hour away. My son has flown into Tamarindo on Sansa or Nature Air several times, and having a small airport nearby is an asset for bringing some of the tourists to the area. Yesterday I showed a surfer returning from his morning surf, so today I am showing a surfer just heading out into the surf on Langosta Beach. I like the reflected image in the water slowly receding on the gentle slope of the beach. 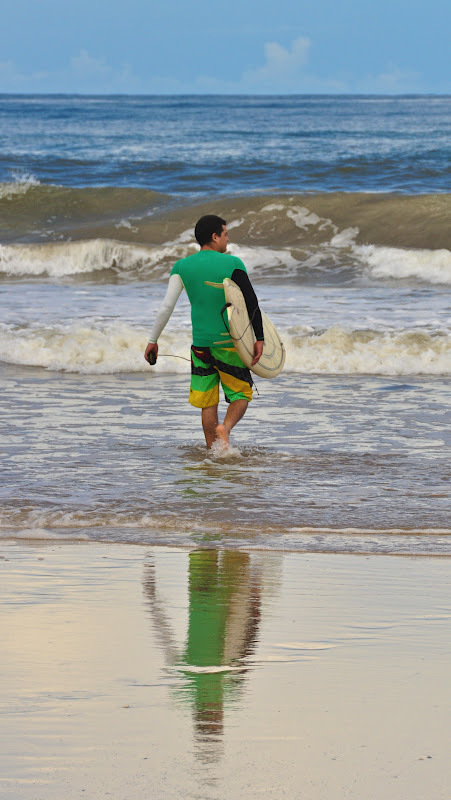 A surfer has finished his morning surfing on Playa Langosta. Directly behind him is the mouth of the Langosta Estuary flowing out to the sea, with waves rolling endlessly into the beach in the distance. The long shadows to the west confirm that this was an early morning surfing outing. Today is Sunday, so we have new photos posted on our Viva la Voyage travel photo site. This week we are showing photos of the colors of the Grand Canyon from Julie's recent raft trip through the bottom of the Canyon. A glimpse back to the south revealed this person in the distance, carrying a bag. There are two likely explanations. He might be a fisherman returning home with a bag holding his catch. He is holding the back out from his body, which suggests that he does not want the wet fish to bump up against him. Another possible explanation is that there are a few vendors who sell Chorotega pottery on the beach. It could be a sack of pottery. 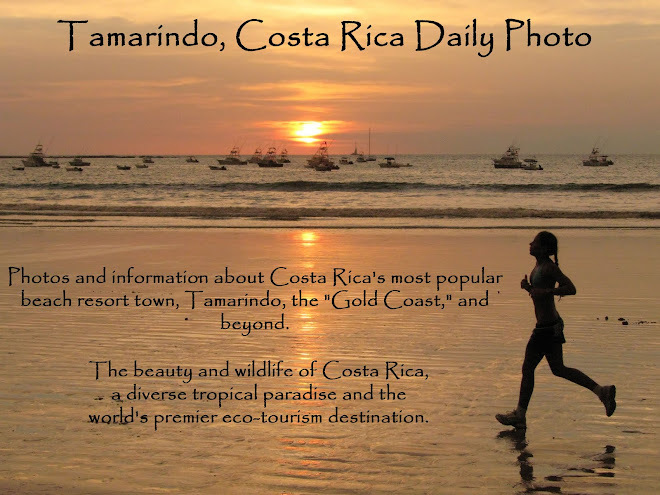 This week we are showing photos of Costa Rica on our Viva la Voyage travel photo site. Our walk along the beach revealed an early riser who went out for a morning paddle board outing. Paddle boarders are rather new in Tamarindo.. We have seen more of them during the past 2 years or so. This looks like good exercise. The paddle boards are bigger and heavier than regular surf boards. I guess if you are strong enough to paddle through the surf, you are likely able to carry the board to the beach. I mentioned a couple of days ago that Langosta beach is not crowded. One might expect to see someone walking by about once every 5 minutes or so. What better place to walk a dog than along the beach? There are volcanic rocks in the ocean at this location. There is an area for swimming with a sandy beach about a block away. This area is excellent for exploring tide pools. As you can tell by the shadows, this was a morning walk, as the sun is in the East. The arrow says "this way home"
As we started our walk along the beach, we noticed this giant arrow a few steps down the beach. Why would anyone do this? Here is my guess. There are beachfront mansions along the beach next to our condo, many of which are available for rent. My guess is that a guest in one of the beachfront mansions drew this giant arrow so that they could find a little path in the trees to get back to the right house. This is a like a beach version of Hansel & Gretel dropping bread crumbs to find their way home. The results might be the same as Hansel & Gretel if the tide comes in before the people come back. Today I will begin a new series and show what you might expect to see on a typical walk on the beach. For the next several weeks I will show some photos that I took on the same July day. These photos will illustrate why my wife and I like to walk along Langosta beach and why we decided to buy a condo there. One of the reasons is that it is not crowded, as today's photo shows. This photo was taken at low tide. At high tide, this entire area will be under water. Yesterday's photo included a bit of a pink flower on the side. Here is a complete view of one of the pink flower balls. I apologize that I do not know the names, but I admire the structure of these flowers. They remind me of an M.C. Esher drawing. This places into context the flower shown yesterday. Costa Rica is lush with tropical flowers, all year around, of course. Today is Sunday, so we have new photos posted on our Viva la Voyage travel photo site. 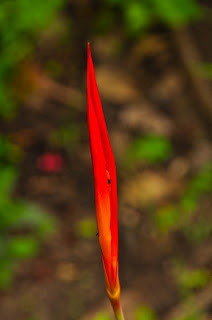 This week we are showing photos of Costa Rica, which of course I show every day on this blog. Here is a delicate flower element. It almost looks like a delicate thorn. I will show the remainder of the flower tomorrow. It is convenient to have flowers all around our condo so I can get always get a few flower photos when I need some more photos to post. This week we are showing photos of the temples of Siem Reap, Cambodia, on our Viva la Voyage travel photo site. After showing bamboo growing the last two days, I thought I would show this photo of a bamboo ceiling today. Bamboo is a good, renewable wood product to use in construction because it grows so fast. This is a a view down the talk of the bamboo stalks that I showed yesterday. I once bought a house in Arlington, Virginia in the winter. I did not realize that when spring occurred, the neighbor's bamboo trees would send up shoots throughout my back yard. I would spend all summer cutting bamboo shoots that emerged from the grass like spears. This group of bamboo shoots caught my eye. These were on the grounds of the Cala Luna Resort, which has lush landscaping amidst its casitas that are its resort units. It is about a block or so from our Langosta condo and we like to walk there for lunch in their restaurant by the pool. Zip lines are a popular activity for visitors in Costa Rica. Every zip line place I have visited uses a double cable system, with one cable suspended from a pulley and a second cable attached to the cable that is suspended between platforms. It is a thrill to zip between the platforms. It is not really an activity intended to view the forest canopy, as you are going too fast to focus much on the trees. 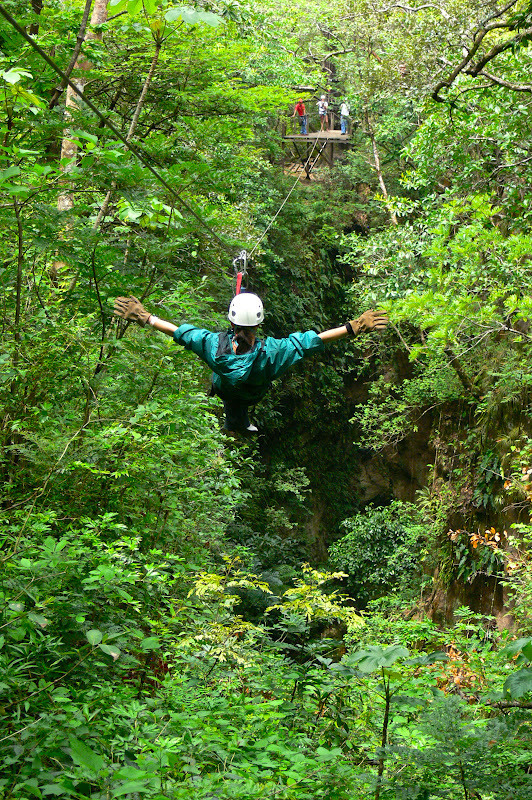 Once you start most zip line activities, there is no way down except to complete the series of platforms by zip lining the rest of the way. Most platforms do not have stairs or ladders to climb up or down. The only way down is to continue zip lining to the end. The last rays of the sun hit a fishing boat and the sand of Tamarindo Beach at high tide. San Francisco point is in the distance. The beaches and coast of Costa Rica are lined with large trees. sometimes the salt air and ocean spray can claim trees as victims, which explains the presence of driftwood the size of trees on Langosta beach. Today is Sunday, so we have new photos posted on our Viva la Voyage travel photo site. This week we are showing some more photos of the temples of Siem Reap, Cambodia. It is one of the world's great monuments, but is less visited to Westerners than places such as Rome, Greece or Egypt. We highly recommend it. This is part of the swimming pool at the Tamarindo Diria Resort. One of our two condos is just above this swimming pool. The pool was walk-in sides like the beach, and little coves and islands, as you can see in this photo. The shape of the pool allows people to have some space to themselves even when there are other people in the pool. The pool is 10,000 sq. ft. (930 sq. m.), the largest in the area. There is a swim up snack bar at the far end. It is popular with guests staying in the condos and the resort. The hotel also has several swimming pools next the beach. This week we have more photos of Julie's raft trip through the Grand Canyon on our Viva la Voyage travel photo site. Here are some hilltop homes above Tamarindo. They are nice houses, with a spectacular view of the ocean. It looks like they have planted a lot of flowering bushes, which they will want to keep trimmed to maximize their view of the ocean. This is one more of the the Langosta beachfront houses. 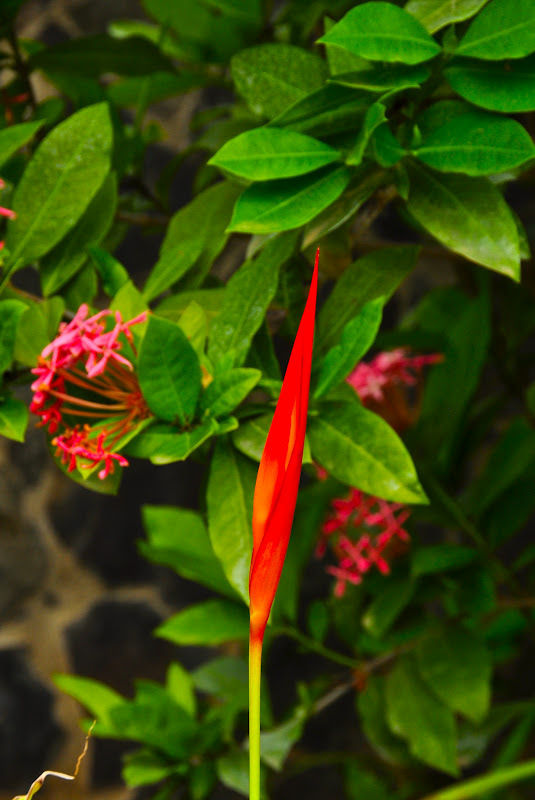 Tropical plants grow so well in our climate that many houses and condos have lush and colorful plants and flowers. Today's worldwide Daily Photo theme is "numbers." We don't have a lot of numbers in Tamarindo. There are no street addresses or house numbers. In small Costa Rica towns, everyone either knows where everyplace is, or they simply give directions by reference to where a place is near. But, we do have a large number of surf boards. There are a lot of surfing shops and surfing schools in Tamarindo, and many of them have surfboards stacked up inside and/or outside the shops. For the Daily Photo theme of numbers, here are 24 surfboards stacked outside one of the surfing lesson shops. Here is a link to a website that shows other City Daily Photo bloggers' interpretation of the theme of "numbers."